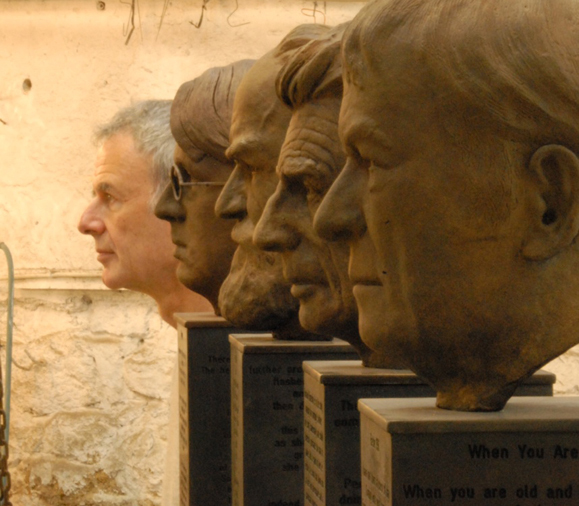 Artist Rowan Gillespie with his sculpture, “The Four Irish Nobel Laureates,” John J. Burns Library. Photo: Roger Kohn. “Without the titanic vision of one man, Brian P. Burns, none of this would have been possible,” writes Roger Kohn of The Four Irish Nobel Laureates, a series of sculptures created by noted Irish artist Rowan Gillespie, now permanently housed in the John J. Burns Library, in the historic, leafy suburb of Chestnut Hill, at the heart of the Boston College campus. Under the direction of Dr. Robert O’Neill, the Burns Library continues to be the world’s premier repository of Irish cultural heritage outside Ireland. As Gillespie’s biographer, Roger Kohn, tells it, “Rowan met Heaney at an exhibition opening in Dublin and asked if he would be prepared to sit for the bust. In Rowan’s words, Seamus was ‘sweet and charming as usual,’” and Gillespie created the bust forthwith. On seeing Gillespie’s completed work, Brian Burns decided that a broader commission should include each of the other three Irish Nobel Laureates, William Butler Yeats, George Bernard Shaw and Samuel Beckett. He convinced Gillespie, who created busts of the three, and the result was formally unveiled in November. Burns, an Irish-American entrepreneur and CEO of San Francisco-based BF Enterprises, is a business attorney and philanthropist. In 1999 he was named one of the Greatest Irish Americans of the Twentieth Century by Irish America. Thanks to an earlier gift made by the Burns family, the college has been able to fund an endowed chair in Irish Studies since 1991, which, next year, will be held by Mary McAleese, immediate past President of Ireland. Saw them in person. Impressive. All four alive? Man, you must be quite advanced in age! As an Irish Exchange Student from NUI Maynooth to Boston College, it is such a pleasure and a privilege to have such rich cultural links with Ireland through the university here at BC. This is a wonderful exhibition, part of a winder Burns Library experience that is truly impressive. A daunting prospect for those called upon to speak at the lectern in the Thompson Room of the Burns Library, between the physical manifestations of Yeats, Shaw, Beckett and Heaney. All very good but you need to correct it to read the four Irish Nobel laureates for Literature, There are many more Irish Nobel laureates in other fields, such as physics, medicine or physiology and, in particular, peace.